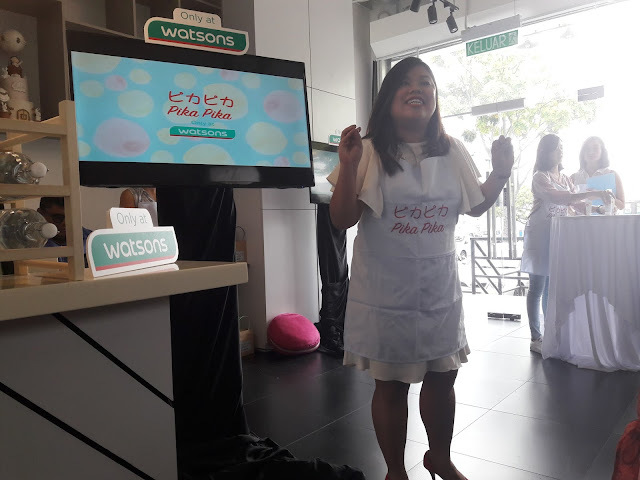 Last Saturday, I attended the Pika Pika Sparkling Bright Tea Party organized by Watsons and Butterfly Project. Thanks for the invitation. Pika Pika is a Japanese skin care brand and Pika Pika means sparkling bright. 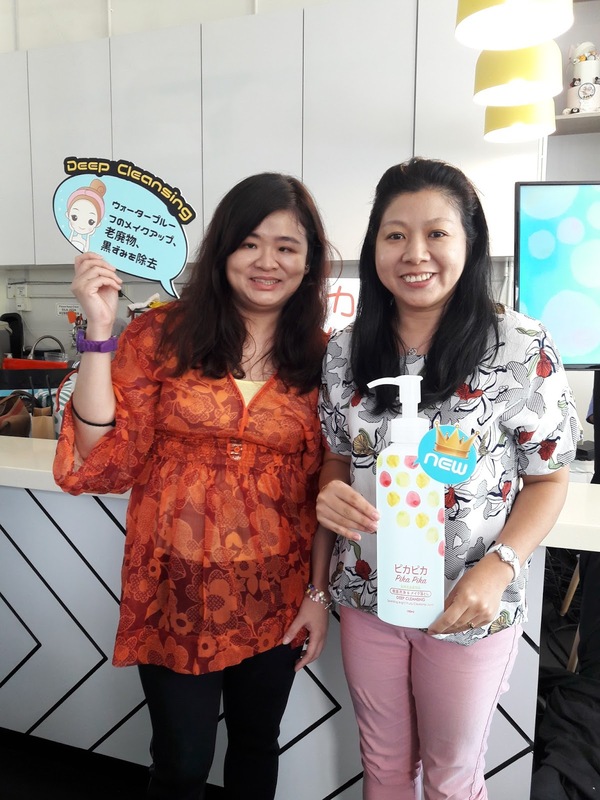 We were introduced to 3 types of Pika Pika Deep Cleansing range skin care products. 1. Sparkling Bright Fruity Cleansing Liquid 190ml (RM 79.00) - Contains natural fruit extract, AHA and BHA. Helps dissolve dead skin and impurities in clogged pores, easily removes makeup in the shower. 2. Sparkling Peel Off Mask 80g (RM 49.00) - Helps purify dead skin and absorbs excess oil, contains ARBUTIN to help inhibit dark spots and freckles and prevent skin aging. 3. Sparkling Bright Hot & Cool Cleansing Gel 35g (RM 39.00) - The thermal hot and cold effect helps to enlarge pores for removing blackheads and dirt, menthol helps to soothe skin and shrink pores, helps purify dead skin and absorbs excess oil. The double function is Cleansing & Repairing. We were asked to come without makeup or with minimal makeup. All who attended the party had to do a no mirror makeup challenge. I brought my waterproof makeup for this. 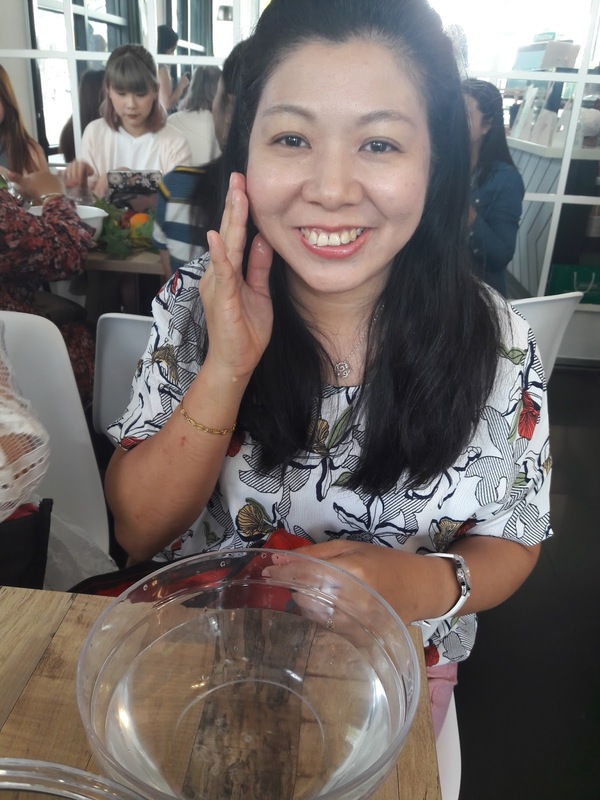 I used foundation, blusher, lipstick, eyebrow liner, mascara but I did not use my eye liner because I was not confident enough. Well, I was glad I still looked great. The no mirror makeup challenge. 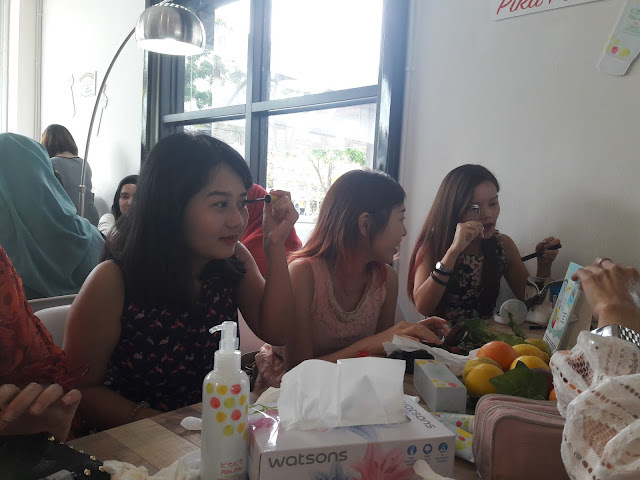 After we did our makeup, we were each given a bowl of water to pat our face with water and use the Pika Pika Sparkling Bright Fruity Cleansing Liquid to wash our face. 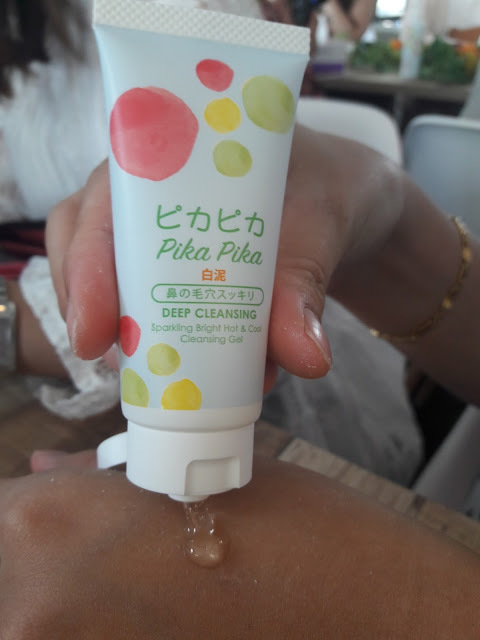 Pika Pika Sparkling Bright Fruity Cleansing Liquid is clear and very waterly. 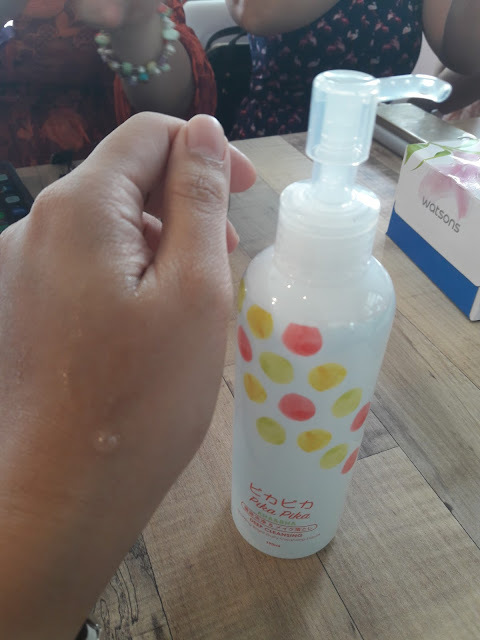 It has a nice apple smell and works really well in removing waterproof makeup. Later I tested the Pika Pika Sparkling Peel Off Mask on my hand. I had to leave it on for 15 mins or until it was dry, then peel it off. 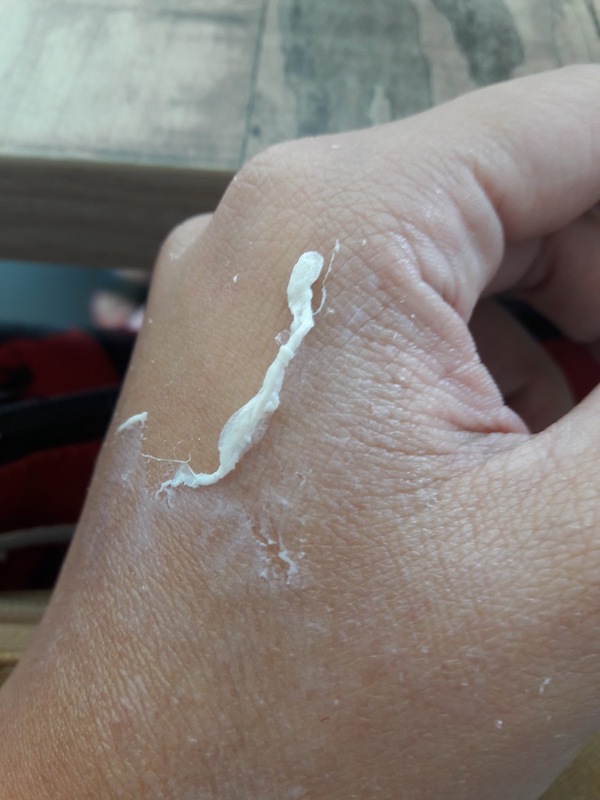 My skin felt tighter when it was dry and it was very easy to peel off. This helps to revive dull skin and prevents skin aging. This contains white clay which is very effective in making your face sparkling bright. We were also asked to put some Pika Pika Sparkling Bright Hot & Cool Cleansing Gel on the T-zone of our face. I felt a little hot sensation and then cold and the thermal effect helps to enlarge pores for removing blackheads and dirt. This is great if you do not like the painful extraction process during your facial visits to beauty centers. There is menthol which soothes and shrink pores. Using this gives the double function - cleansing & repairing. 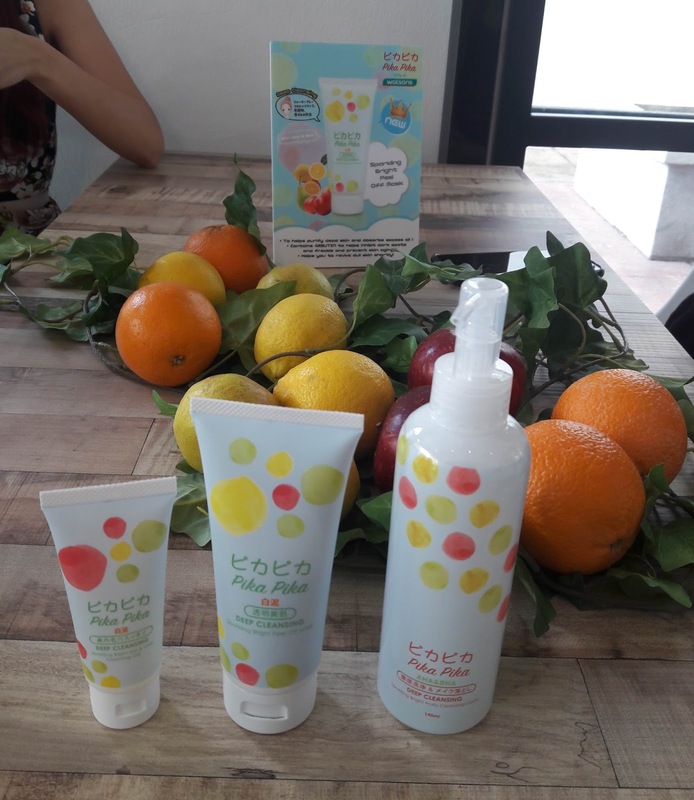 You can get these Pika Pika Sparkling Bright range at Watsons, either online http://www.watsons.com.my/ or at Watsons stores. If you buy online, you can use Promo Code : PIKA10A to get RM 10.00 off. This code is valid until 31st July 2017. At the end of our party, there were lots of delicious, sweet desserts. 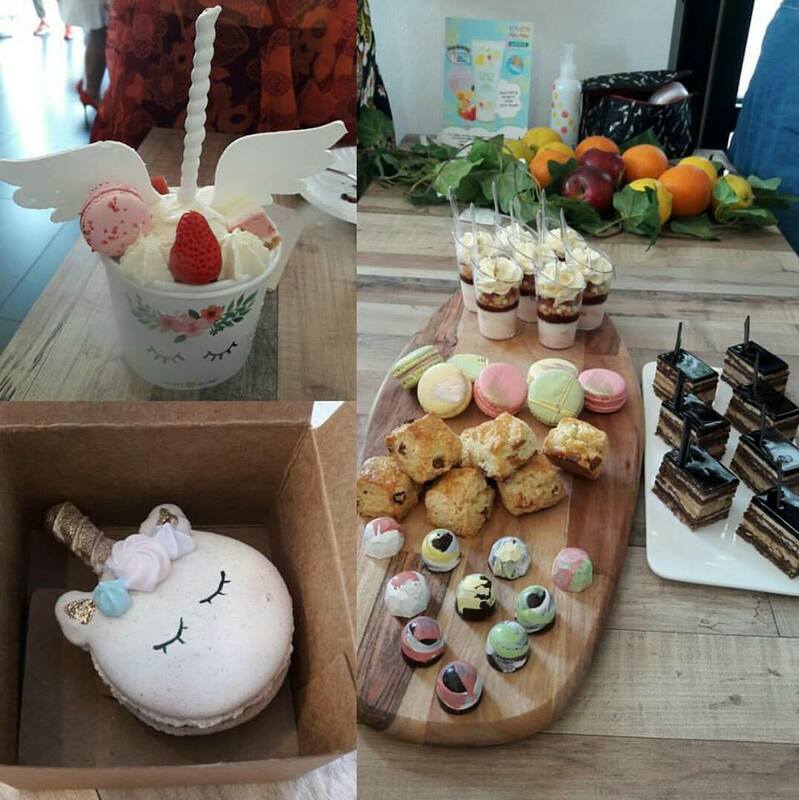 All were very nicely decorated especially the Unicorn macaroon and Unicorn ice-cream. Thanks to Forêt Blanc for the delicious desserts. Probably after the face looks sparkling, it also looks bright. The photo of me starting to wash my face with the bowl of water was how I looked after the no mirror makeup. 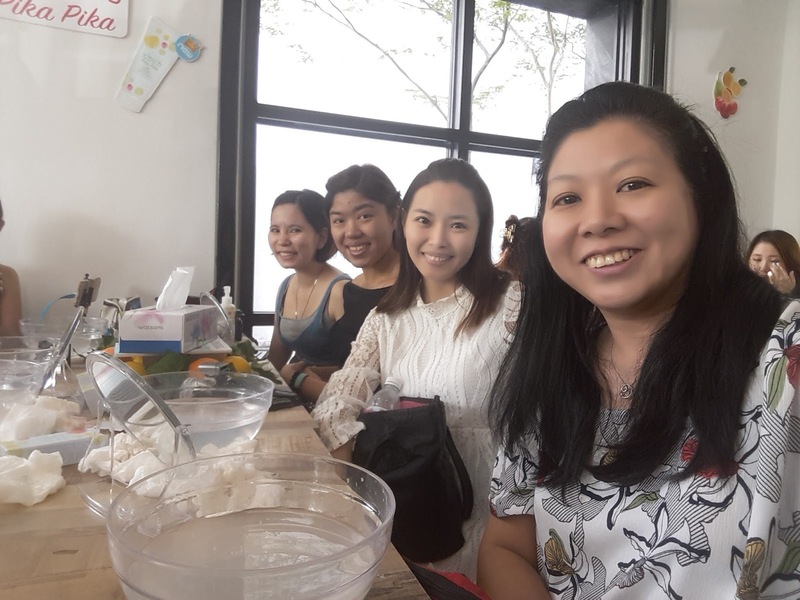 Try the products, you might like them. I love the cute desserts there. Yes, this is healthy and delicious for the whole family.